John Dereszewski served as the District Manager of Bushwick’s Community Board 4 during the time of the 1977 blackout and has written and lectured extensively about Bushwick’s past and current history. If you ever look across Wyckoff Avenue from the subway station near Myrtle Avenue, you will see Planet Fitness with a barely noticeable Greek-like arch at its pinnacle. This was the site of a movie palace called the Parthenon, which had its gala opening in 1921. When, four years later, the county line was re-drawn, the Parthenon, which was previously located in Brooklyn, “migrated” into Queens. 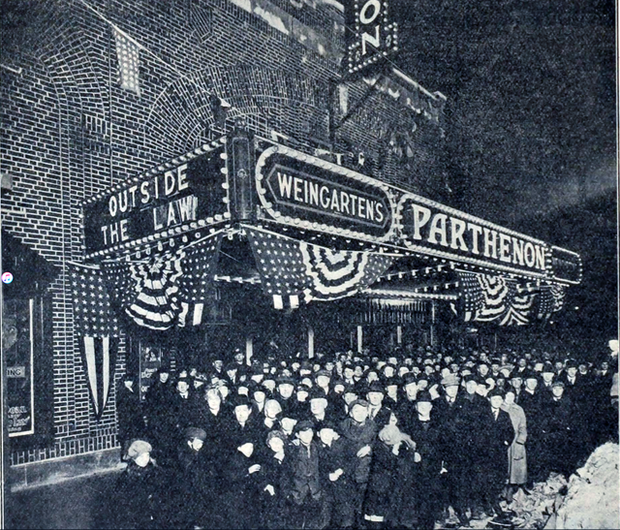 While this move obviously muddled the Parthenon’s borough of residence when its schedule appeared in the newspaper Movie Boxes, the same problem curiously affected many of Ridgewood’s other—and always Queens-based— movie theaters, which, over the years, were consistently listed under the Brooklyn heading. This remained true of the old Ridgewood Theater until it closed for good less than a decade ago. So, what gives? The answer to this lies in the shifting ZIP code lines of Ridgewood and Bushwick. When the 20th century was young, both the counties of Queens and Kings were served by their own postal districts. When, however, a population explosion occurred in Ridgewood at about that time, a real problem emerged. With its headquarters based in far-off Flushing, which at that time could have been in a different time zone, postal service proved to be grossly deficient for this rapidly expanding neighborhood. On the other hand, Ridgewood’s main street, Myrtle Avenue began its run in Brooklyn almost literally in the shadow of the borough’s main post office. This made postal delivery for the borough of Churches vastly superior. Thus, about one hundred and ten years ago, the community leaders of Ridgewood—and neighboring Glendale as well—petitioned the post office to have their districts transferred to Brooklyn. The request was granted, postal service improved greatly. And everyone was happy. Before you accuse these Queens residents of disloyalty, we must realize that, at that time, they identified far more as Brooklynites. Don’t forget, Ridgewood came “straight outta Brooklyn.” The neighborhood’s development began in the 1890’s right where Bushwick’s had stopped. Its growth was based on the Brooklyn street grid, which pushed relentlessly into Queens with reckless disregard to the historic county line. When these mostly German residents visited their friends and neighbors, they were far more likely to travel to Bushwick—or even to the Lower East side—than anywhere in Queens. And when they wanted to catch a vaudeville show or a movie, they went to Broadway in Brooklyn. So it was no surprise that in the early 20th century the local historian Eugene Armbruster would designate ALL of Ridgewood as effectively belonging to Brooklyn’s Eastern District. As the years went by, two Brooklyn postal zones and then ZIP codes—11237 and 11227—that straddled both boroughs were formed and, as far as everyone was concerned, provided excellent service. Things began to change in the 1960’s as urban blight began to beset Ridgewood’s Bushwick neighbor. This culminated in the disastrous blackout and fire in 1977. While these traumatic events did have a silver lining for Bushwick, since it placed that community’s plight in public view and made the resolution of these problems a high priority item; this was an unmitigated calamity for Ridgewood. That community’s reaction could be summarized as: “There is this horrible blight situated right next to us; it’s getting worse and worse; and it’s coming our way!” In short, the need for Ridgewood to divorce itself from anything Brooklyn became very urgent. 1978 was an election year and an open Congressional seat was at stake in Western Queens. Long-term and extremely conservative Democratic incumbent, James Delaney, had announced his retirement and the Republicans, who were far stronger at that time than they are today—they controlled two local Assembly and one State Senate seats—were poised to add this Congressional seat to their column. To that end, they nominated a local Assemblyman, Alfred DelliBovi, as its standard bearer. The Democrats, on the other hand, had difficulty in agreeing on a candidate. It was only after a contested, three-way primary that a relatively obscure Assistant DA named Geraldine Ferraro emerged as its candidate. The Democratic prognosis did not look good. It was, however, at about this time that the Ferraro campaign created an issue that would greatly define the race and energize its candidacy. Specifically, she said that the time had come for “us”—Ridgewood—to have “our” own ZIP code. This had a galvanizing effect that provided great momentum to the campaign. While the GOP couldn’t oppose this very popular position and basically just went along with it, in this case, just saying “me too” was not saying enough. During the campaign, which occurred during my Bushwick District Manager days, I attended several meetings at St. Bridget’s Church, which straddled the boroughs, where the discussion of the ZIP code issue loomed large. My reaction to this was pretty ambivalent. As a partisan Democrat, I really wanted to retain the seat and welcomed the “push” that the issue gave to Ferraro. On the other hand, as the representative of the “them” community, I found the many references to looking after “we” and “us” pretty unnerving. When election day arrived, Ferraro scored a shocking 10% victory over her GOP foe—the actual breakdown was 54.2% to 44.4%. Given the size of the margin, it is unclear just how decisive the ZIP code issue was. Such factors as superior Democrat organization, GOP overconfidence and the fact that DelliBovi proved to be a terrible candidate, may have been of greater significance. But the “we want our own ZIP code” issue was clearly the most visible and memorable aspect of this important race. Upon being elected, Ferraro proved true to her word and vigorously worked to create the Queens only ZIP code. And so in 1982—warp speed as far as the Post Office was concerned—the 11237 zone was re-drawn to only include Brooklyn; the 11227 zone ceased to exist; and the new 11385 zone was created to exclusively serve Ridgewood and Glendale. And everyone was happy, though as the Ridgewood Theatre’s continued placement in the Brooklyn Movie clock demonstrates, things did not always go without a hitch. The successful change in the ZIP code lines was but one of many contributions Congresswoman Ferraro made in an exemplary career that culminated in her historic and ultimately unsuccessful vice presidential candidacy in 1984. History does not stand still, though. Ridgewood has become a more diverse community than it was in 1982, and a far more stable one than Bushwick was in 1977. Still, the influx of Hispanic residents to its southern tier, the infusion of Polish refugees from upscale Greenpoint, and of course the beginnings of a hipster invasion has made it a more distinct community from neighboring Glendale. Thus, it is not surprising that, in recent years, the good people of Glendale have also voiced the need to have a ZIP code of their own. Featured image of the Parthenon, a movie theater at Myrtle and Wyckoff which was sometimes located in Brooklyn and sometimes in Queens, courtesy of cinematreasures.org.